Q - "I am experiencing problems with Handbrake on macOS Mojave. When I put in a DVD, it says that I need to install a libdvdcss.pkg file, and when I follow the link to the download website, it says that my computer is too advanced for the software. I've tried everything but nothing works. Is there any easy-to-use free DVD ripper for macOS?" People who posed the above question apparently have a notion of what Mac DVD ripper software is for. Before the analysis of best four free DVD rippers for Mac, you should know why DVD ripper software is necessary for Mac as well as Windows users. A good DVD ripping tool could change and facilitate your way of entertainment and open the door to a world of watching DVD movies offline on the go, with no need of DVD drive. To be specific, you will be able to playback DVD movies on Mac, iPhone, iPad, PC, Android phones and tablets, etc for free. Here we put emphasis on best free Mac DVD rippers of 2018-2019, for DVD encryption tech keeps changing and only software constantly updating could really meet users' need. For example, many of you perhaps are troubled by not being able to rip Frozen or Inside Out DVD on Mac/PC with your previously installed program, due to strong Disney X-project DRM. 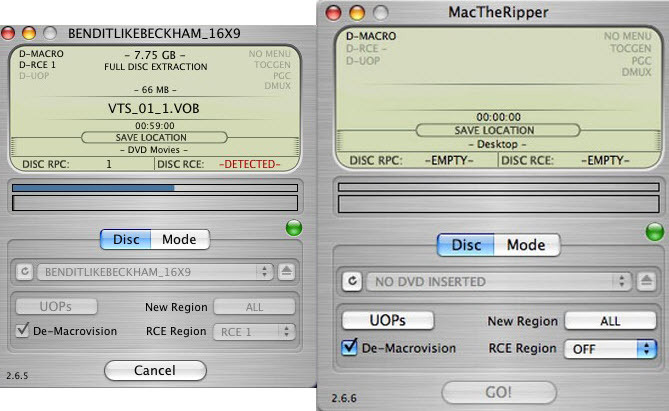 So we do a new size-up and include best four free Mac DVD ripper software as below, with testing statistics and effects to help you do the choice. WinX DVD Ripper Mac free, developed by Digiarty Software, is a free DVD ripper software for Mac OS X 10.6.6 and later (up to 10.14 Mojave). It enables you to rip DVD to MP4 and to Mac/iOS/iTunes specific video audio formats for free. Converting DVD to MKV, MPEG, FLV, MP3, etc for playing on PC, iPhone, iPad and Apple TV. 350+ built-in formats and devices! Output quality can be ensured by the High Quality Engine. DVD ripping on Mac can be done fast with optimal video/audio (Dolby 5.1 Channel) quality. Most importantly, it deals with commercial DVDs, scratched DVDs, covering complicated workout DVDs, 99-title discs, folders, ISO images. And it is easy to handle. HandBrake is probably the most well-received DVD ripping software for Mac, Windows, Ubuntu, etc. 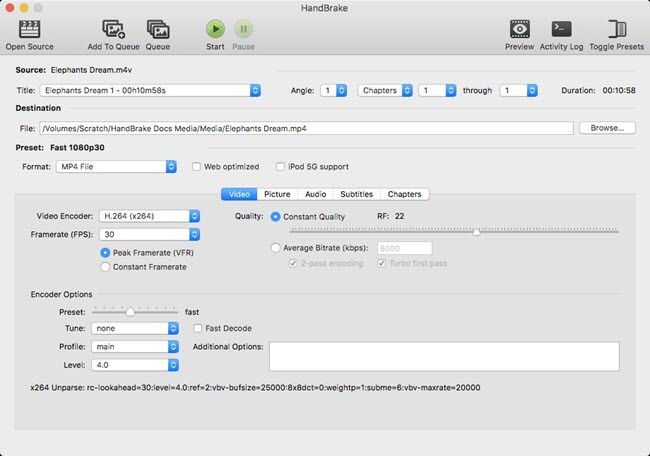 HandBrake Mac 1.2.0 now supports hardware accelerated DVD ripping. It rips DVD disc/ISO image/VIDEO-TS folder to MP4 and MKV formats, encoded in H.264, H.265, MPEG-4 and MPEG-2. Despite being embedded with only two output formats, it's favored by Mac and Windows users for being free. But you have to download install libdvdcss for HandBrake to bypass copy protections. But without device presets, there would really be much trouble and you'd better be with excellent mathematical calculation skill. In a word, HandBrake Mac DVD ripper is good but not that easy-to-use. Besides, this free DVD ripper is unsupported on Mac 10.9 Mavericks and below, and is depricated in El Capitan and Yosemite. MakeMKV is good free DVD ripper software for Mac, Windows and Linux. It rips both Blu-ray and DVD to MKV, and can cope with DVD copy protection AACS. Common functions like preserving chapters information and track languages are included. Sadly, you can tell from its name that this free Mac DVD ripping tool will only allow you to output an MKV file. Converting DVD to AVI, MP4, MOV, FLV can't be realized using it. And on its download page there is a NOTE warning you that MakeMKV is not signed by Apple. To successfully install the Mac DVD ripper, you need to adjust gatekeeper options. MacTheRipper 2.6.6 can be counted in this top 5 list of free Mac DVD ripping software of 2018-2019. It is free, and it enables users to rip DVDs by defeating DVD protections CSS, UOP and region code. However, unfortunately, this free DVD ripping tool is not compatible with Mac OS X newer than Snow Leopard. Mac users who have upgraded to Mavericks, Yosemite or El Capitan have to either pay to get MacTheRipper 4 or find other workarounds. And the worst part is, when we click the free download button, it just jumps to the buy page of MTR 5.0.07. We believe there should be other pages offering the free download link, and maybe you can do a quick search. 1. Better choose "Safe Mode" on the main interface of WinX DVD Ripper for Mac when ripping Disney DVDs. 2. Libdvdcss has been removed since HandBrake 0.9.2, which requires you to download libdvdcss by yourself for ripping copy protected DVDs on Mac. 3. Ultra-fast ripping speed actually is opposite to the lossless original quality, though not diametrically. A best free Mac DVD ripper can help you reach the best balance to rip DVD fast while maintaining high quality. Easily rip unprotected/protected DVD movies on macOS Mojave or lower to AVI, MP4, H.264, MOV, WMV, MPEG, MTS, FLV, iPhone, iPad, Apple TV, iTunes, Android Samsung Galaxy,Huawei, HTC, Chromecast, Xbox, Sony PSP/PS4, etc (up to 350+ profiles). Best three DVD rippers for Mac of 2019 are compiled in this article. All of them are top-rated Mac DVD rippers that can help rip DVDs on Mac, including new macOS Mojave. Download the best free DVD ripper software for Windows 10/8/8.1/7 to convert DVD to MP4, AVI, MKV, MOV, iPhone or any device at ultrafast speed with original quality.